Baku holds bike ride under the motto "Less cars, more life"
The bike ride was held in Baku under the motto "Less cars, more life" in connection with the World Health Day at 12:00 (GMT+4) on April 7, AzVision.az reports. The bike ride was initiated by the Azerbaijani Ministry of Ecology and Natural Resources. 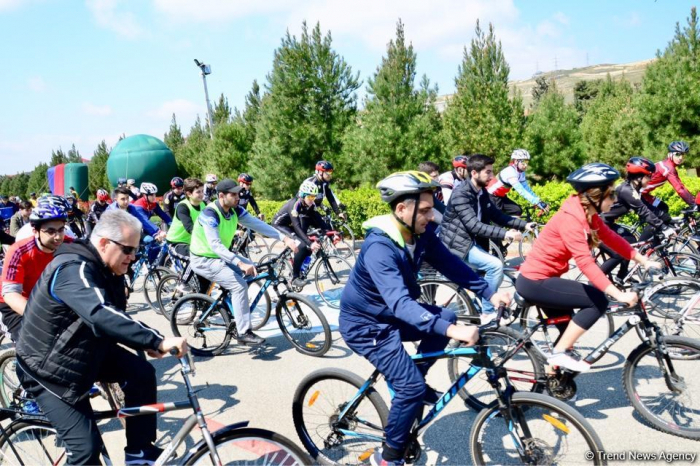 The bike ride was organized by the World Health Organization, the Public Health and Reforms Center of the Azerbaijani Health Ministry, the Azerbaijan Cycling Federation and the Republican Olympic Cycling School. The representatives of the Azerbaijani Ministry of Youth and Sports, the State Security Service, the State Customs Committee, the State Service for Mobilization and Conscription, the Baku Transport Agency, Azerigas Production Union and students of the Academy of Public Administration under the President of Azerbaijan and the Azerbaijan State Oil and Industry University participated in the bike ride. April 7 has been annually celebrated as the World Health Day since 1950.